I am in the coin business, so I need to pay attention to lots of different issues. But as a collector, like many of you, I am mainly concerned with the series that I am collecting. Most market issues that don't relate directly to what I am collecting are irrelevant and sometimes even a distraction. What do they say, "It's not the destination but the journey that matters". Close enough, in my words the excitement and satisfaction of collecting comes from what I learn about each coin as I pursue my collecting goal. And there is so much to learn! If you are thorough and deliberate and don't just write a check you will not only have a collection of coins, which you eventually may sell, but you will develop knowledge and understanding that will be with you forever. Enjoy your coins! The Treasury Department released numerous bags of 1898-S dollars in the mid-1920s and again in the 1940s and 1950s, primarily from storage in the San Francisco Mint. They had little value as collectors' items in the 1920s, and very little in the1940s and early 1950s either, and were widely dispersed, including to visitors to Nevada casinos. By the time of the 1962-1964 Treasury dispersal, most 1898-S dollars were gone. Their names are Lucy and Lucretia and they are certainly two "hot numbers". And now a number of the country's top coin dealers, as well as numerous dedicated collectors of the gold spouse series, are seriously pursuing them. And, to be clear, we are not talking about two "ordinary" First ladies here. We are referring to what may be a pair of the lowest mintage regular issue coins that have ever been struck by the US Mint in over 95 years! These two coins are none other than the 2011-W Lucretia Garfield and Lucy Hayes Mint State $10 Spouse Gold coins. Let's look a little closer at these two coins. We are forty-seven years into the clad era and the dust is yet to settle. Even though there's a lot of action to be had, it seems the hobby as a whole can give the clad era one great big shrug of the shoulders. I maintain that our apathy is at least partly due to the low opinion that ‘50s- and ‘60s-era collectors held and still hold about clad coinage. Progress continues on our World Coin Project, and by the end of the month, we expect to have fourteen countries ready for viewing. We are dividing the world into three major regions: Europe, Asia and the Americas. 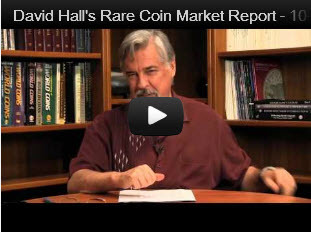 David Hall gives his weekly rare coin market report. One of the more prolific world mints is the Perth Mint. Every year, Perth produces a plethora of coins for Australia and well as other oceanic countries. The PCGS Set Registry is a powerful inventory management tool built for coin collectors of all levels.